TITANIC ERA, 1910's vintage gauntlet gloves. Fine taupe & gray cotton knit and gray cotton. Pleated ruffles at gauntlet edges and two bands of gray pleated insets. Five inch gauntlets with gray facings and snap closures. Three decorative embroidered points palm back. Finger sheath gussets. 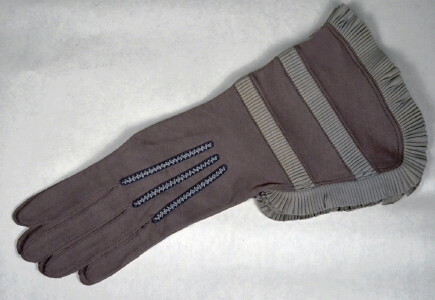 Extraordinarily fine, all original 1910 vintage dress gloves. Length from hem to finger tip - 12 1/2"
Width measured across palm - 3"
Opening width - 4 1/2"
Excellent condition! Shows some age discolor at pleated trim.